Facebook swaps out its usual grandiose advertising with this cute TV spot from Wieden + Kennedy that captures some of the intimate emotions behind social media. In the past, Facebook's ads have been criticized for not focusing on the intimate, human moments that social media can spur. Its Facebook Home ads last year were big, cartoony and surreal, and 2012's "Chairs" was even more over the top. But the new spot, titled "Say Love You Better," takes Facebook in a different direction. Life-size speech bubbles pop up over two lovebirds as they send short messages back and forth to each other via Facebook Messenger. It's also a clever take on mobile messaging, which often only mentions texting features in ads. The idea is to show that Facebook Messenger can share much more than text—it includes audio, video and stickers. 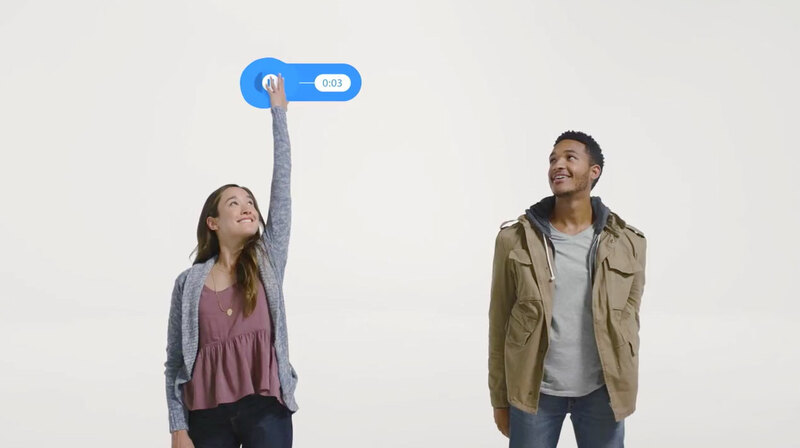 The 30-second spot feels like a mix of Oreo's "Wonderfilled" and some of Google's better TV work—and indeed, the director here, Aaron Duffy of 1stAveMachine, has done lots of Google ads, including its famous 2010 Super Bowl spot "Parisian Love." The ad is running in Los Angeles and Chicago, and the campaign will be expanded to include out-of-home elements in November—a first for Facebook. Billboards in Chicago and L.A.'s airports and freeways will play up creative showing the different features of Facebook Messenger. Ads will also wrap Chicago's "L" trains and bus shelters. Whether the campaign will drive app downloads is unclear, but it's a tactic other digital companies are latching on to. Earlier this week, Foursquare launched its first brand campaign also aimed at driving app downloads using out-of-home and digital ads. The media push comes at a key time for Facebook, as the number of mobile messaging apps continues to grow. A report from Forrester Research earlier this year outlined the top 10 messaging apps, with Facebook Messenger claiming only 200 million users, compared to 500 million for WhatsApp (also owned by Facebook).